The 5th annual Healthy, Wealthy & Wise Gifts will be open only for a VERY LIMITED TIME from June 1st to June 26th, 2015. 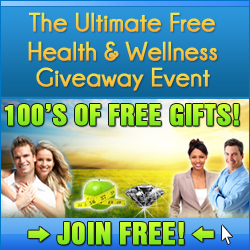 When you go there you’ll find a multitude of products – all FREE – provided by Health, Fitness, Wellness and Prosperity experts from all over the world. The organizers of the event are Dr. Joe Rubino, Carolyn Hansen & special guest host Curtis Farrar. This style of event emerged when founder Stephanie Mulac held her first giveaway in 2006. It’s in the form of a “Giveaway” which is sort of like a giant electronic trade fair where 100’s of experts offer their products free to the public. This year Self-Esteem Expert Dr. Joe Rubino, and Carolyn Hansen, renowned fitness professional, along with special guest host Curtis Farrar are continuing the tradition with the 5th annual Healthy, Wealthy & Wise Gifts 5 Giveaway. These can be very expensive but at http://healthywealthywisegifts.com/go/292 you can pick this information up completely FREE. With summer fast approaching, what better time is there than right NOW to set yourself and your business up for future success? This event is a life-changing experience for those who take it. Come and join Dr. Rubino, Carolyn, Curtis and me and see for yourself. ‘To connect people to their full potential by providing education and awareness. Putting them back on track with the necessary life skills to reach and achieve their goals and aspirations. Letting go of the past and present to create a happy healthy future’.